snow in large parts of Europe, huge hurricane in the eastern United States - crazy ending of the warm season, so let us concentrate on horses and their riders. 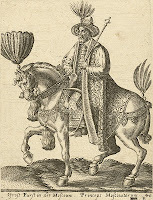 Abraham de Bruyn also created beautiful images of riders and horses with their tack, leaders and warriors of the Grand Duchy of Muscovy or simply Muscovy (Lev Gumilev teaches us, in his books, that Russia only starts with the great warrior and first rate statesman tzar Peter I although Western and Soviet/Russian historians tend to give 1547 as beginning of Russia, while in our neck of the woods our Polish-Lithuanina Commonwealth stopped using the name Grand Duchy of Muscovy only in 1764 or so). 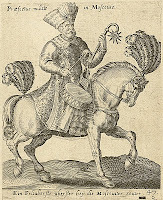 noble (perhaps a boyar or oprichnik ) armed as with a lance like Polish and Hungarian hussars (perhaps the cost-cutting engraver just added these details to spice up the image for and edition aimed at some wealthy patron etc). We know that the Muscovites tried to form a winged hussar unit in XVII century. 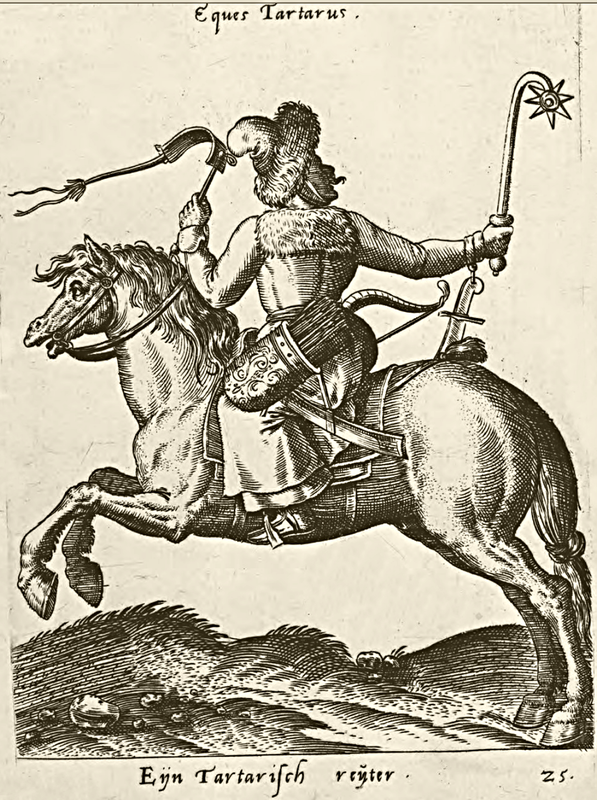 Note the sabre hanging down on the lanyard in two woodcuts (loop of rope or leather thong fixed to the sword hilt, used to hang down the sword from the wrist), facilitating its use when axe was moved to the left hand or earlier when bow was used. 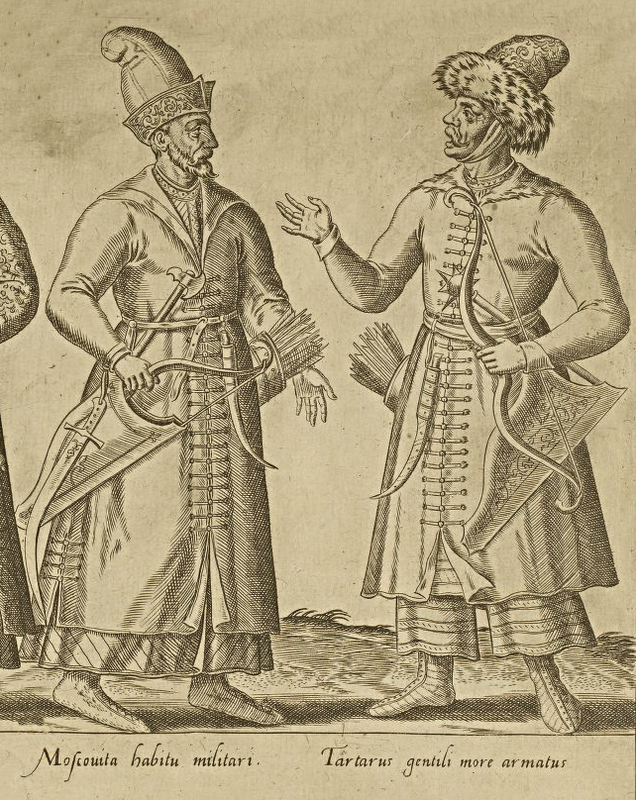 Muscovy fighting the Tatars of the Pontic-Caspian steppes always encouraged their settlement, participation in the armed forces and administration aided by the eventual conversion to Christianity. 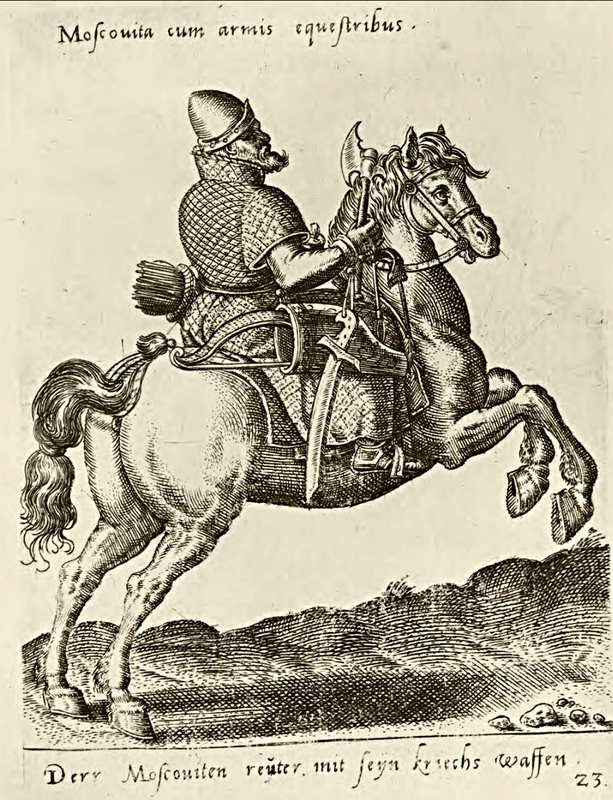 They have small gelded horses, unshod, and with very light bridles, and their saddles are so adapted that they may turn round in any direction without impediment, and draw the bow. 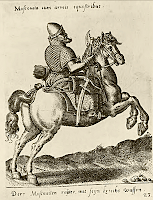 They sit on horseback with the feet so drawn up, that they cannot sustain any more than commonly severe shock from a spear or javelin. 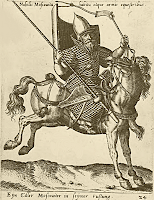 Very few use spurs, but most use the whip, which always hangs from the little finger of the right hand, so that they may lay hold of it and use it as often as they need; and if they have occasion to use their arms, they let it fall again so as to hang from the hand. 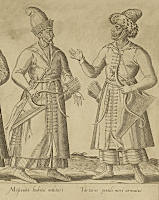 Their ordinary arms are a bow, a javelin, a hatchet, and a stick, like a caestus, which is called in Russian, kesteni; in Polish, bassalich*. 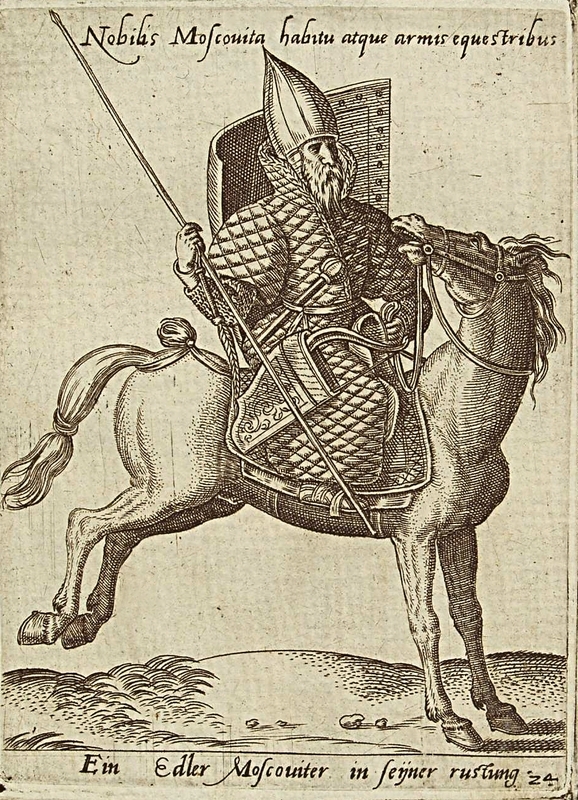 The more noble and wealthy men use a lance. They have also suspended from their arm oblong poignards** like knives, which are so buried in the scabbard, that they can scarcely touch the tip of the hilt, or lay hold of them in the moment of necessity. 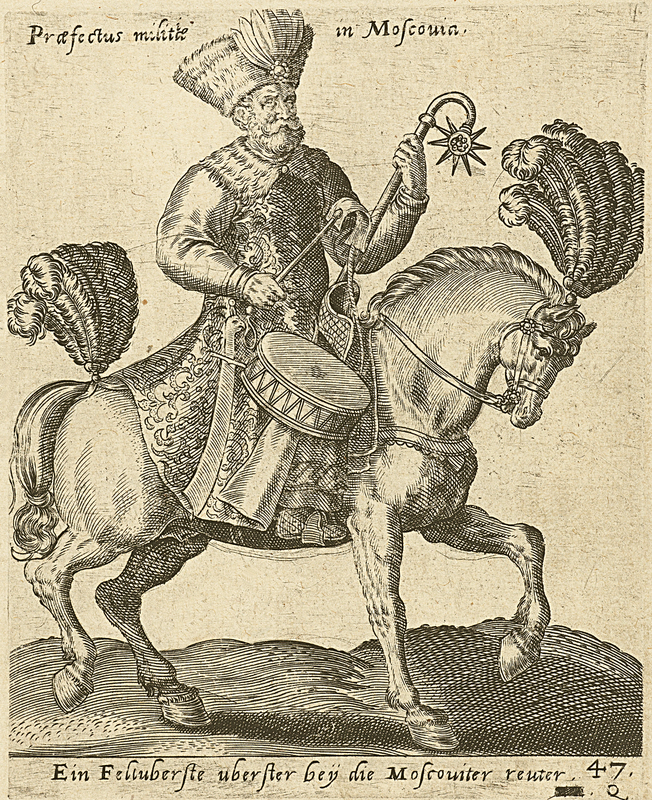 They have also a long bridle perforated at the end, which they attach to a finger of the left hand, so that they may hold it at the same time as they use the bow. 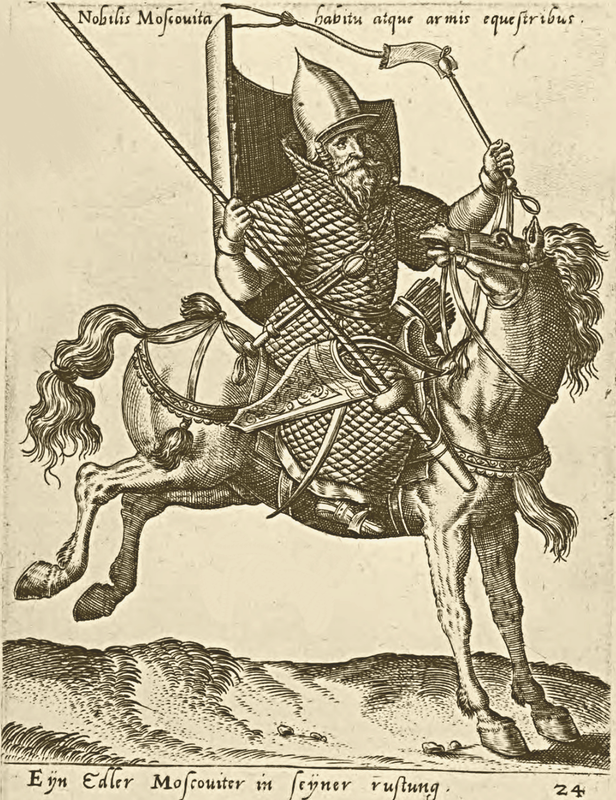 Moreover, although they hold the bridle, the bow, the short sword, the javelin, and the whip, in their hands all at the same time, yet they know how to use them skilfully without feeling any incumbrance.' Some of the higher classes use a coat of mail beautifully worked on the breast with a sort of scales and with rings; some few use a helmet of a peaked form like a pyramid. Some use a dress made of silk stuffed with wool, to enable them to sustain any blows. They also use pikes.